I was asked by a company called Chili Fresh to take a look at a new tool they're creating. It is designed to allow book reviews written by patrons to display right in the catalog (similar to reviews on Amazon.com showing up right on the item details page). I agreed, and have spent some time on this, because I really like the concept - integrating useful data right into the library catalog. One of the biggest problems with library resources is that they're too complicated to use. The databases we subscribe to are great, but if using them requires patrons to jump through hoops, then the patrons are not going to use them. As an example: NoveList is one of the best databases libraries can offer. Its readers advisory information is unmatched. But, because it's a stand-alone tool (the proverbial "information silo"), it's just that much more difficult for patrons to use. Counter to this is LibraryThing for Libraries, which provides readers advisory information right in the catalog - you know, where our patrons already are. I don't think the suggestions provided by LTfL are as good as NoveList (yet), but its ease of utility makes it a far more practical tool. And this is what caught my eye with Chili Fresh. 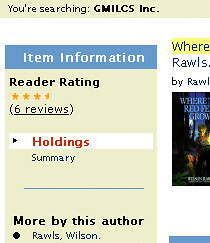 Patrons-created book information, right along side the library's book information. That's great. Just like comments on a weblog, getting patrons involved and interacting with the library is going to enrich both the tool and the experience. I've spent a few hours this week playing with the Chili Fresh tool (my test page), and sending emails back and forth to the developers. They readily admit this tool is still in beta, and has a ways to go, but they are open to comments and have already incorporated a few of my suggestions. I encourage anyone interested to set up an account and play too, and let them know what you think. The more input provided by libraries, the more this will be shaped into a useful tool. It seems a bit clunky right now, because the examples are all outside of a library catalog. But they're definitely on the right track, and the idea is worth some attention. You can sign up on their website for a test account, or contact them Scott Johnson (jscott [at] chilifresh.com) for more information. A note about their website: you'll notice that many of the pages are blank. I asked about this and was told that, since the product is still in beta and is changing, they are limiting the amount of information available.